The Löwchen has always been kept solely as a companion animal, making it easy for them to adapt to life with almost any family. While known for their unique 'lion' appearance, some owners choose to keep their fur in a simple, one length, short clip. 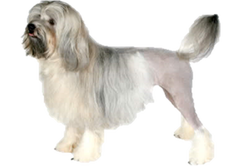 The Löwchen is one of several breeds included in the bichon family of dogs, the others being the Bolognese, Maltese, Coton de Tuléar, Russian Tsvetnaya Bolonka, Bichon Frisé, and Havanese. The origin of the Löwchen, like all of the bichon family, is largely a mystery. It is likely that the Maltese is the oldest, having been favored by both the ancient Greeks and Romans. The Fédération Cynologique Internationale (FCI) lists France as the Löwchen’s country of origin. However their name disputes this, as it translates to ‘little lion’ in German. However it came to be by the 1500s the Löwchen could be found throughout Europe in France, Germany, Russia, Holland, Italy and Spain. Aside from their origin, the reason for their traditional haircut is also debated. Some suggest it traces back to the Middle Ages when they were kept by ladies and used as bed warmers. The exposed areas would have been warmer to the touch than the long coat. It is more likely, given their name, that they were simply shaved so they appeared more lion-like. Like many breeds, the Löwchen suffered greatly after World War II, leaving only a handful of breeding dogs to continue the line. In 1960 the Guinness Book of World Records recognized it as the rarest breed in the world, and this claim was repeated in 1973. Through several dedicated breeders their numbers increased, leaving the Löwchen rare today, but with stable numbers.